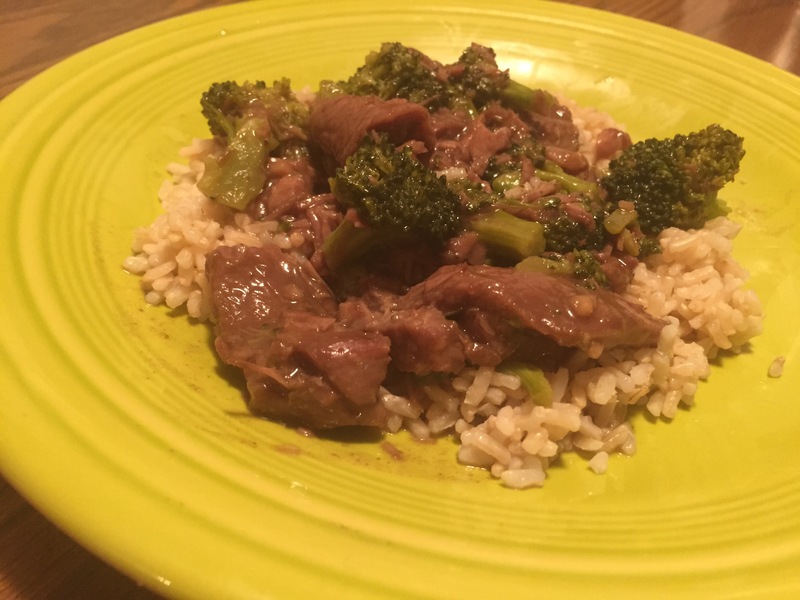 Crock-Pot Beef & Broccoli – Small Town Mrs. If the weather is anything like our here in SD, nothing is better than a nice warm comfort meal. It has been sooo COLD here, and we just got quite of a bit of snow with the nasty cold and wind! No fun! Luckily for me, I don’t have to leave my house during the days, unless it’s to go grab the mail from the mailbox! Love this new adventure of being able to be a stay at home wife! When it’s cold like this I love to use my crockpot and since we haven’t been to town and we both love our Chinese takeout! This recipe has taken both our loves and combined them!!! I found this recipe on Pinterest from The Recipe Critic. Since we live 40 miles from town and thought I had all the ingredients, I really didn’t, I did have to substitute some but, I still think it turned out awesome! 1. In a mixing bowl or right in the crockpot whisk together the beef broth, soy sauce, brown sugar, sesame oil, and garlic. 2. 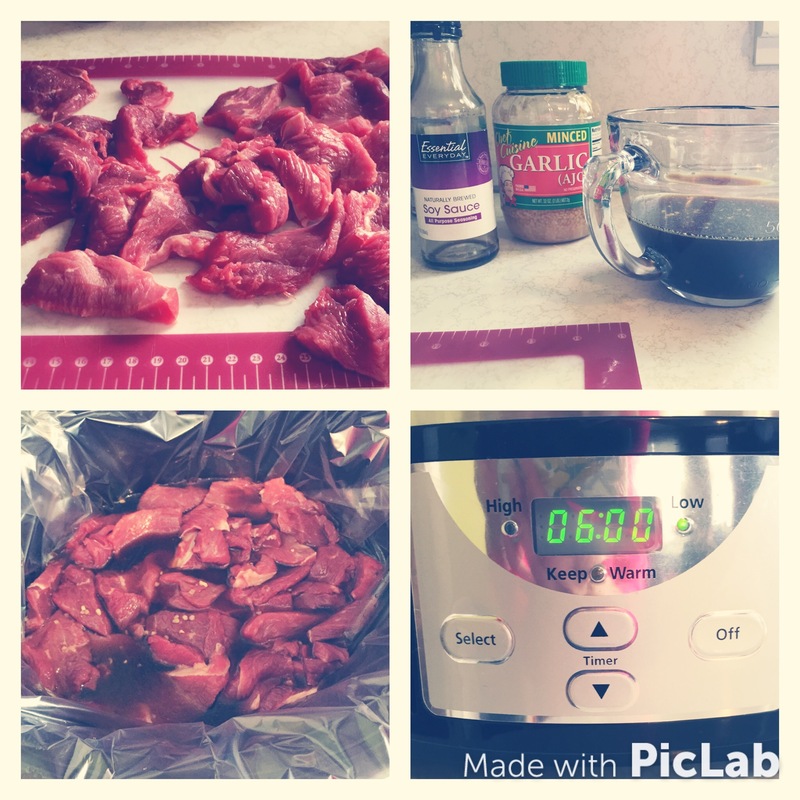 Lay the beef strips in the crockpot and pour the sauce over, tossing the strips to coat. 4. When it is just about done, take 4 Tbsp of the sauce and whisk it in a small bowl with the cornstarch. If you like it a little thicker you can add another Tbsp. Slowly stir this into the crockpot. Add the broccoli after you mix in the corn starch mixture. You will want to let it cook about an additional 30 minutes so that the sauce can thicken and frozen broccoli can cook. My fresh broccoli turned out about perfect after the additional 30 minutes. Ours did turn out a little bit on the sweet side, it wasn’t sweet all day while it was cooking so I’m wondering if the fresh broccoli caused it. I’m not quite sure but, I will have to try again with frozen broccoli just to see! I know the pictures aren’t the greatest but, I’m working on that with my camera. Promise I’m trying to get the hang of this all! ** Have you heard of Bountiful Baskets? If not you should really check them out! I love it especially in the winter when I don’t have my garden to go pick the veggies from. For $15 + $5 handling fee you get a basket 50% Vegetables 50% fruits. You can also buy add ons like bread & more quantities of fruits. It’s really a good deal. To find out if it’s in your area or town just check out the website!